Beet juice is often touted as the latest health elixir, but there's a lot you need to know before drinking gallons of the stuff. Although this juice contains a wealth of beneficial vitamins, minerals and antioxidants, undiluted beet juice may cause side effects ranging from rashes and hives to paralyzed vocal chords. And while these side effects are temporary, they can be scary and unpleasant. Here's how to enjoy the health benefits of beets safely through juicing. Properly juiced, beets are a powerful detoxification drink. The juice encourages liver cleansing and lymphatic circulation, both important aspects of detoxification. The juice from beets is quite high in many vitamins and minerals. It's a good source of calcium, iron, vitamin A, vitamin B-6 and potassium. It also contains sulfur, sodium and choline in amounts useful for health. To juice beets, you'll need a good quality juicer such as the Vitamix, Champion or Norwalk types. Use only fresh beets. Both the root portion and the leaves can be juiced. Choose small to medium sized beets that feel firm when you squeeze them. Avoid blemished or soft beets. Soft beets indicate vegetables past their prime. Both the taste and nutrients suffer. To juice beets, follow the manufacturer's directions for your juicing equipment for the setting and duration. 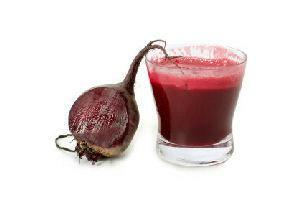 Drinking a lot of beet juice can cause temporary discoloration of the urine and stools. You may notice a different color or even a pink or 'beet colored' tint to them. That's how powerful the pigments are in beets. Never drink juice from beets alone or in great quantities. While rare, reported side effects include hives, chills, fever and stomach upset. Always dilute it with other natural, freshly juiced fruits or vegetables. Juice from beets is high in oxalic acid, and drinking too much can result in side effects like those mentioned above. People with kidney stones or a history of kidney stones should either avoid beet juice entirely or use it sparingly since the oxalic acid in beets can increase the likelihood of stones. Avoid combining beet juice with vegetables high in calcium, since oxalic acid can combine with calcium to form deposits and stones, too. Vegetables high in calcium include broccoli, bok choy and some leafy green vegetables. Since it's recommended that you enjoy the juice from beets in combination with other juices, what tastes good with it? Adding freshly juiced apples, carrots or other fruits not only makes beet juice more palatable, it decreases the likelihood of side effects and increases nutrition. Always use fresh juices for the best taste. In addition to avoiding beet juice if you're prone to kidney stones, many nutritionists recommend that patients with arthritis avoid beet juice since the oxalic acid can increase the painful inflammatory condition that occurs with arthritis. People with gout are also wise to avoid beet juice. If you've got a so-called sensitive stomach and find it hard to eat spicy foods, you may want to try just a little bit of beet juice to make sure it doesn't hurt your stomach. Beet juice has been known to cause stomach irritation.